Crushed Special B Malt for use in all grain and partial mash brewing. Crushed Special B Malt is used in small quantities in all grain and partial mash brewing to add an extra colour and a caramel flavour to Belgian Beers. 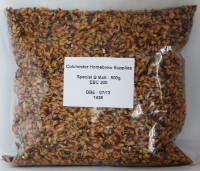 This convenient size is normally sufficient on its own to satisfy your recipe requirements for 3-5 brews as most recipes containing crushed Special B malt only tend to need 100-150gms per 5 gallon/ 23 ltr batch.